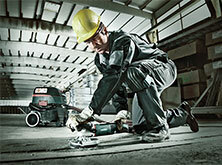 For angle grinders with tool-free guard adjustment the clamping lever must be removed. Please pay attention to operating instructions! 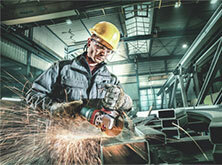 Integrated sliding segment for quick, tool-free access even when wearing gloves, for working close to walls. Suitable for: W..9-125; WEV 10-125 Quick; W..12-1..; WE..15-1..; WE..17-1..; W..8-1..; WE 9-125 Quick; W..11-1..; WQ 1400(only 6.00346); WE 14-1..; Not suitable for angle grinder with Autobalancer; scope of delivery incl. nut with two holes 5/8" and M14. Sheet metal table with guide rollers for easy, precise feed. Protect delicate surfaces from scratches.